Transport yourself back to the late summer of 1982, and you wouldn't have been able to pass a radio without either Irene Cara's "Fame" or The Kids from Fame with "Hi Fidelity" blaring from the speakers. 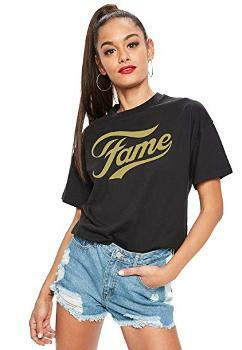 There was no escape from the gang of American dance students when you switched on the TV either, as the Fame TV series became hugely popular here in the UK. Walk into any music store (in my case, Woolworths) and you would have found it almost impossible to avoid the many flyers promoting the kids' debut album, which topped the British album charts for a whopping 12 weeks - it felt like a lifetime - and by the 12th week you were extremely tempted to ask the nearest young teen girl if you could borrow their leg warmers to shove in your ears and use as ear muffs! To this day, the album remains the biggest-selling release on BBC records and sold over one million copies. It became the second-biggest selling album of 1982, with Barbra Streisand claiming the top spot with her compilation album Love Songs. The first of a number of singles, "Hi-Fidelity" was released in August 1982, and entered the UK singles chart at No.46 on 8th Aug. The single reached a peak position of No.5 for one week on the chart starting on 29th Aug. 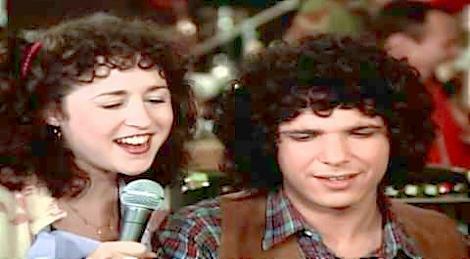 Apparently, the only members of the group to actually contribute to the song-writing process on the group's songs was Lee Curreri on synths (he played Bruno Martelli) and Lori Singer (Julie Miller) on Cello. You can see both of them on the "Hi-Fidelity" single sleeve photo below. The group's follow-up single "Starmaker" was also a top 5 hit. As we all know, the pop music industry is a fickle business and by the summer of 1983 the British audience was already beginning to lose interest in the gang's songs, with the single Body Language stalling at #76 in the charts. However, the TV series continued on BBC1 until 1987. Apparently, the only members of the group to actually contribute to the song-writing process on the group's songs was Lee Curreri on synths (he played Bruno Martelli) and Lori Singer (Julie Miller) on Cello. You can see both of them on the "Hi-Fidelity" single sleeve photo below. The group's follow-up single "Starmaker" was also a top 5 hit. 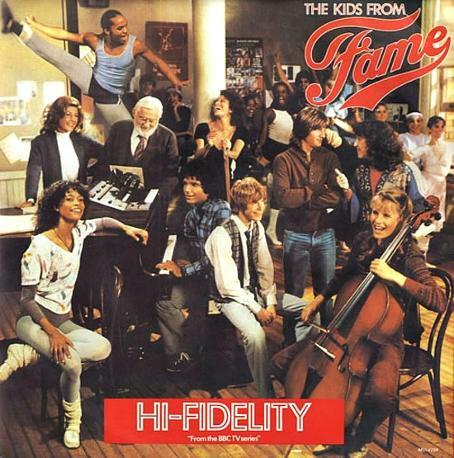 Lasting for two minutes and 46 seconds, Hi-Fidelity was the first track on side two of The Kids From Fame LP. "Starmaker" (which reached #3 in the UK) featured as the opening track to side one. Who else misses having two sides to an album?